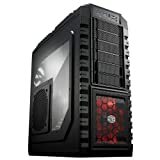 A PC case among most underestimated components when building a new computer. It is not surprising that even gaming enthusiasts don’t take it into much consideration. However, the fact still remains that computer cases are just as important as any other accessories. Despite being more costly than traditional PC cases, gaming cases are actually worth the price. Investing at least $500 on a high quality case might sound too much. However, try and inquire from any computer game fanatic that has actually purchased one. He/she will confirm that it is remarkable and extremely helpful. And above all, the investment was actually worth it. Buying a good looking PC case requires that you make an informed choice. This will enable you to get a product that will last and allow you to enjoy the latest games. There are various factors that you need to put into consideration if you desire to purchase a high quality gaming case. 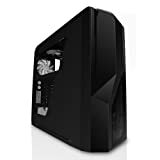 These include the size of the case, number of supported drives, number of supported motherboards, compatibility with water-based cooling system, excellent airflow, spacious interior, side windows, stylish design, among others. The budget limit also plays a major role in the selection process. However, you should not concentrate a lot on the amount you spent. You need to first consider the size of the gaming case. Choosing the right size ensures that all the essential accessories will fit in perfectly, the biggest PC case may not be the best. When it comes to style, select a custom PC case that incorporates an elegant construction. This should be coupled with an LED illumination and a side paneled window. If you want a water cooling case or clear computer case you have to spend more. Having considered each and every factor involved, the following 6 popular computer cases will certainly guarantee great value for your money. Silverstone is among leading brands when it comes to the world of gaming cases. Introduced in 2005, the company has constantly dedicated itself to manufacturing superior quality cases. 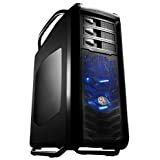 The high end full size ATX Tower PC case is one of its most highlighted models. This case incorporates an array of advanced features designed to be to compatible with the current as well as future hardware. This is among the most popular gaming case. It incorporates a durable metallic construction fabricated from premium quality steel and aluminum. 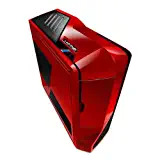 This case features an advanced ventilation system that serves to cool your computer. Unlike other conventional cases, the cables are well-organized to minimize clutter. This case comprises of two major compartments; an upper compartment designed to house the motherboard with a lower compartment designed to accommodate the poser supply. This air cooled white computer case is fabricated from hard clear plastic and steel. 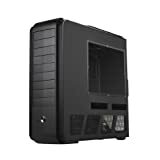 Despite featuring a lower price tag than the above reviewed models, this case offers you with additional features and controls the provide the ultimate gaming experience. The interior is well-lit and incorporates two fans that provide enhanced airflow. This case is designed to be compatible with nearly all kinds of motherboards. It features a whopping 9 expansion slots and a 7-driveway design for great versatility. The Cooler Master HAF X is unarguably the best among the company’s long line of gaming cases. 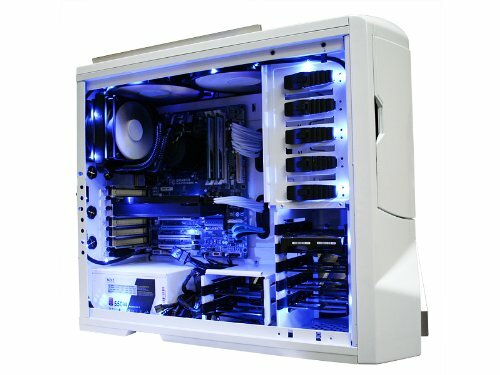 This case is ideally designed to be used on those hot PC systems. It features a sturdy and durable construction to guarantee long years of use. The case incorporates all the features and functions that are essential in system cooling and management. 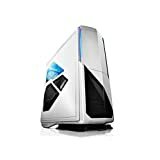 This gaming case does not only cool the processors and motherboards, but it also functions to coll the graphic cards. This small low profile PC case features among the world’s largest. The case features an ergonomically designed rubberized handle that enables you to comfortably carry it around. Storm Stryker comes in a stylish design featuring a perfect blend of white and black colors. 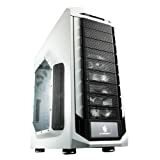 The case has two cooling fans, a window panel, and advanced filtered covers for excellent dust control. It is designed to accommodate all gaming systems. The mid tower is yet another notable model from phantoms long line of modular computer tower carrying cases. The case incorporates a slim design with a neutral white color. It offers a wide range of cooling options. Actually, this case offers greater value compared to its predecessor. Replacement of the hard drive disk is quick and easy. As with most of the company’s models, this case is fabricated from durable plastic and steel for exceptional durability. Despite being the cheapest among the reviewed models, it offers you with a set of features that will actually perform beyond your expectations.